As a child, you most likely sang "Do-Re-Mi" or maybe even "My Favorite Things." And chances are you watched the film version of The Sound of Music, an adaptation of the 1959 Broadway musical about a nun-in-training who becomes a governess to seven motherless children in an Austria about to enter World War II. To celebrate the film's 50th anniversary, the performance tour company Music Celebrations International put together a festival this week in Salzburg, the picturesque setting of the 1965 Oscar-winning film. The festival, produced by managing director of concert production Cindy Petty, features tours, recitals, and sing-a-longs at various film locations, and the highlight is the final performance at the Mozarteum concert hall on Friday. Festival artistic director and conductor Judith Clurman crafted the program for chorus, orchestra, and the opera singers Maureen McKay and Joseph Beutel. 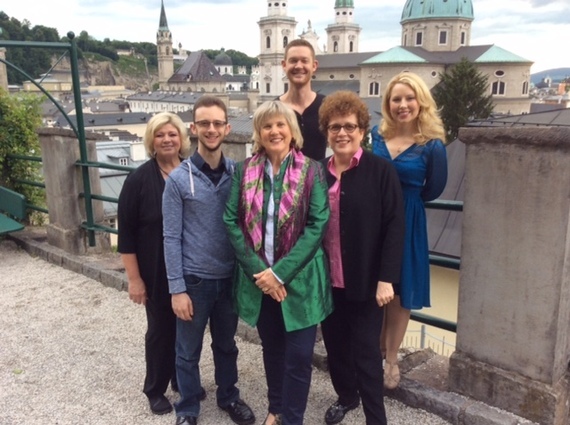 "Judith brings a wealth of experience in... understanding how the stories of Broadway connect to our original composers and to historical and political events and the ability to bring choirs together," Petty said, calling from Austria. First row: Cindy Petty, pianist Jeremy Robin Lyons, granddaughter Elisabeth Von Trapp, and Judith Clurman. Second row: Joseph Beutel and Maureen McKay. Photo by Bruce L. Ruben. While this concert will be Clurman's first time conducting Rodgers and Hammerstein's music, she spent many years studying the scores. "Every time I open up one of these scores I find something new and exciting, the same way I do when I open up the score of a symphony or opera or any great piece of music," she said in a recent phone interview. For this program, she didn't want to copy the film score. She sought new arrangements of each piece, arrangements that had to work with a 150-voice chorus, the soloists, and a 32-36 player orchestra. She worked with music director David Chase to arrange the "Sound of Music Suite," a world premiere commissioned by Music Celebrations International with orchestrations by Tony Award-winner Larry Hochman. The evening will also feature songs from other Rodgers and Hammerstein musicals, including a never-performed Trude Rittmann arrangement of "Getting to Know You" from The King and I. While researching at the Rodgers and Hammerstein Organization, Clurman came across a photocopy of a choral fragment that Rittmann wrote of "Getting to Know You." She adapted this arrangement for women's chorus and soloist and hired Josh Clayton, assistant musical director at City Center Encores!, to finish the orchestration. Clurman has long been fascinated by Rittmann, who arranged nearly all of Rodgers and Hammerstein's choral and dance music. "I get thrilled when I look at her choral writing," she said. "Great music sounds simple and real, and when you study the actual score you see how she understood musical anatomy, voice leading, and counterpoint." After coaching the singers in New York and about 15 hours of rehearsal in Austria, the show will commence, honoring a film that remains beloved by both children and adults after 50 years. "The entire team made magic," Clurman said of the film's endurance. "The story is about love, family, and good versus evil, and the movie tells us to climb every mountain and follow our dreams." Petty added, "There's something about the movie that just makes you happy. The story brings together the uniqueness of family life, friends, closeness, and the role music has in all of that." The film also lives on through generations because children, even toddlers, love to watch and sing the many delightful songs. Clurman recalled that in sixth grade she wrote a song to the tune of "My Favorite Things" and taught it to her class. She smiled at the memory and thought of the task ahead: "I'm going back and teaching 'My Favorite Things.'"